Check out the new ad on the right side of the page. Becki Whitler Dahlstedt thought this site would be a good place to promote her studio and the upcoming 9th Annual Off The Beaten Path Studio Tour in Mountain View, Ark. 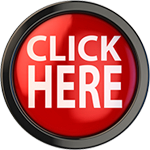 Click on the ad and it will take you to the web site. What’s Becki been up to? 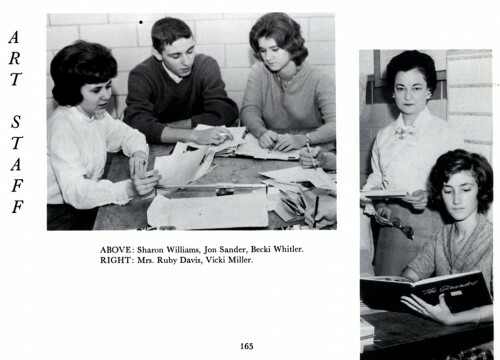 I was unable to come to the latest ’60s class reunion but have enjoyed getting news and photos from Ken’s website. After living in Boston, Berkeley and San Francisco for many years working as a consultant, city planner and administrator, I have spent the past 25 years getting back to what I love – being an artist. In high school that was my passion -(I was the art editor of the yearbook my senior year)and I continued as an art major at SEMO. 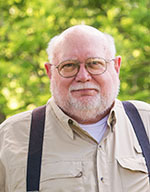 I came to Mountain View, Arkansas, while still living in St. Louis, 26 years ago, met the potter at the Ozark Folk Center, a state park here in Arkansas dedicated to preserving the crafts and music of the Ozarks, and stayed! David and I have been married 25 years and after spending 13 years demonstrating pottery at the Folk Center, we now have a wonderful studio adjacent to our home in “downtown” Mountain View. We are full time potters and market our pottery here in Mountain View and throughout the state. Nine years ago we started an open studio tour so that folks could visit the private studios of the many wonderful artists and craft artisans here in the Mountain View area. It has become more popular and well attended each year. I volunteer many hours to promote the tour as well as other art events here in Mountain View. 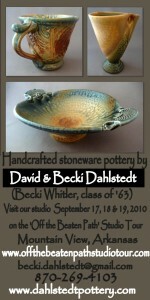 This year’s 9th Annual Off the Beaten Path Studio Tour will be held on September 17, 18 & 19. I decided to advertise our pottery business and the studio tour on Ken’s website in hopes of reaching some old friends who might like to come visit our studio during the tour. Some of you might remember Tom Holland – his dad was the minister at the First Baptist Church in Cape for many years. Tom is a beadmaker and is also on the Studio Tour. It is a fun weekend to spend in Mountain View and you can make reservations here through our website (click on the ad to get there). You can also find out about all the artists on the tour at our website. I was also Becki Nunnelee, married to Mark Nunnelee from 1964 to 1978). Thanks for the connection with Tom Holland. While I recognize your name, I knew “Tommy” during those years. I believe he may be about my age – I’m CHS class of ’69. Becki, I went through your website the other day and you and your husband have beautiful items. I love that you make things that are utilitarian AND beautiful. Love the pottery and the website, and envy the life. Thanks for the connection, Ken. Becki, It was interesting to see what you are up to now. I enjoyed the video — the pottery is beautiful. Hi there Becky. It’s great to hear that you are doing well. I didn’t hear much about you after nineteen sixty six when I joined the Air force. We all scattered to the four winds soon after that. Hows Bonnie doing? I haven’t seen or talked to her since the early seventies. Tell her I said hello. Hope she is well and enjoying her life as well. Live strong and be happy! Becky, I remember you so well from high school. I seem to remember (my memories are not always accurate these days,however) that we both played clarinet in the band. You were always so nice and easy going and easy to be friends with. Your pottery is beautiful. I think it is the colors you use that I find most amazing. Do you have a catalog or a price list, or can your wonderful work only be bought in person? I remember your pretty face from high school. Love your pottery! Congrats on the wonderful store that you have in Mountain View. I would love to drive down in the fall and see your shop. I, too, would be interested in seeing a catalog as I really like your covered casserole dish and the pitcher with matching glasses. So sorry to hear about Mark’s passing, but it seems that you have found an interesting future there in Mountain View and I wish you well. Interesting Pictures! I’m a photographer (SG3 Photography, based in Siloam Springs, AR) so I enjoy seeing these kinds of photo’s. Keep up the good work! Previous PostPrevious Do You Think Cape Will Approve Gambling Casino?